Don't let unpredictable mountain conditions affect you. With the Eigerjoch Pro IN Hooded Jacket Men, you are prepared for the wind and weather. 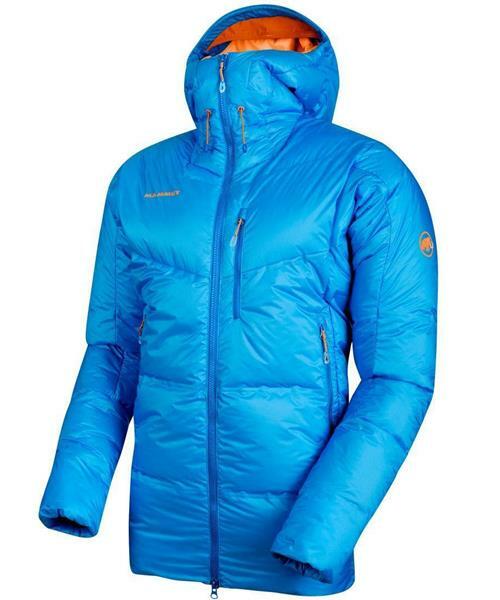 The insulating jacket protects you from moisture and water with its extremely lightweight Pertex® Quantum Pro material. A combination of down and PrimaLoft® chambers on areas exposed to moisture ensures optimum moisture-wicking and a comfortable body climate. Goose down and feathers keep you warm, while bonded external seams favor enhanced heat retention and weather protection. The jacket is tailored to alpine movement sequences thanks to Mammut® Vertical Motion Technology™, which draws on optimized ergonomics. Mammut® High Reach™ technology allows unrestricted freedom of movement when climbing. You can overcome any mountain challenge.